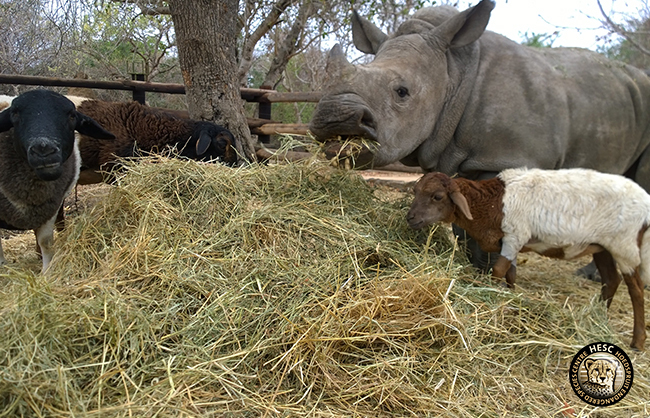 Lammie, our resident Pedi sheep, is a devoted surrogate mother to the orphaned rhinos at the centre. Lammie has always stepped right into her duties as surrogate mother, playing with and taking care of her gigantic ‘babies’. 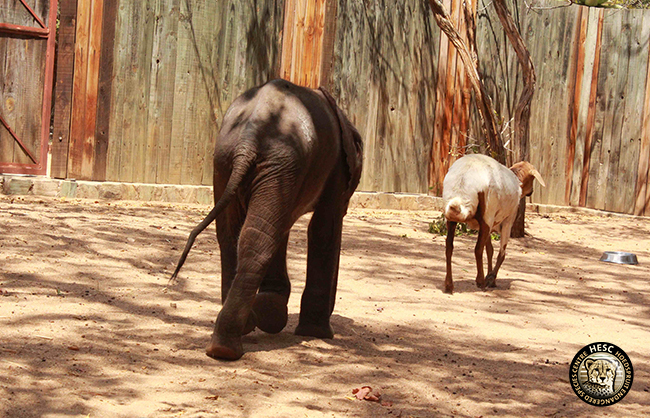 When Amanzi, the young orphaned elephant, arrived at the centre we naturally introduced Lammie to him. 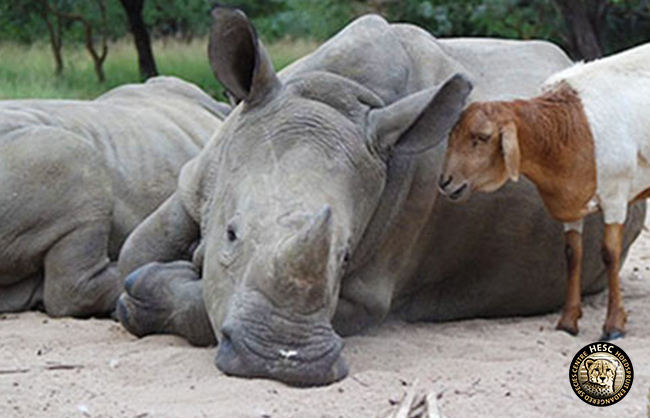 The encounter was a strange one, as Lammie is used to rhinos and did not know what to make of this tiny animal with an unruly and unusually long nose. When sheep and elephant first met, they were apprehensive of each other. But as they spent more time together, Lammie quickly took on her natural motherly behaviour. We could see a relationship starting to form, and Lammie stood by for support during Amanzi’s short time at HESC. Bottle time proved to be the most difficult time of day. Amanzi was often not interested in the bottle, and less than enthusiastic about taking its contents. Lammie showed signs of stress whenever Amanzi was in distress, and stood right beside Amanzi trying to comfort him. Amanzi would become noticeably calmer. Sadly, despite the bond between Amanzi and Lammie growing stronger, the tiny elephant began to lose condition each day. 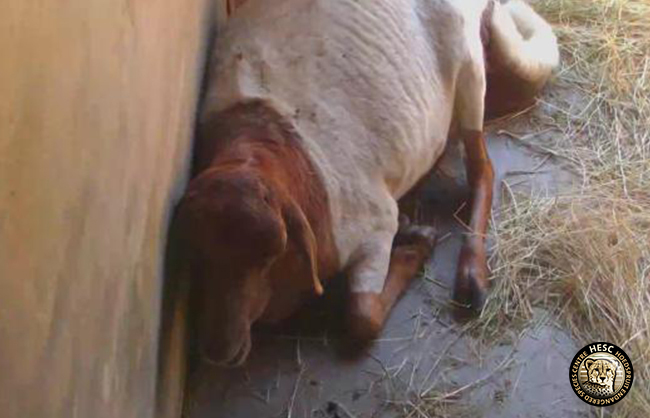 It was devastating for us all to lose such a precious animal, but Lammie lost a surrogate baby and new friend. At HESC, we form bonds with the animals, but Lammie forms lifetime partnerships. She gives her all to her charges. After Amanzi’s death, Lammie seemed lost in the enclosure they had shared. We decided to move her back to the comfort of her young rhino family. 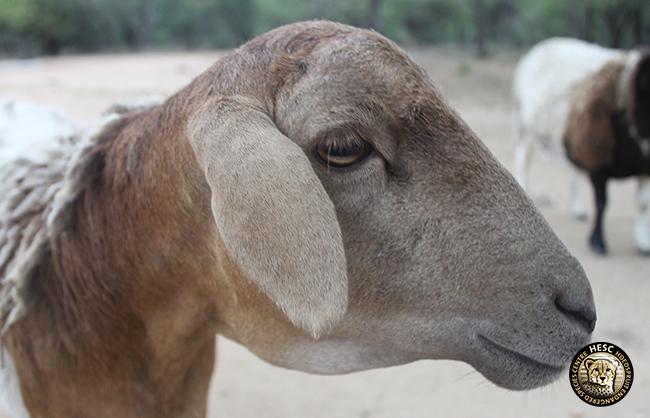 Lammie’s spirits have lifted since she was reunited with Gertjie and the boys. She is back to grazing, and wondering around the centre in their company. We are happy to see that our mothering sheep is still herself, but have no doubt that Amanzi will always occupy a piece of her heart …. as he does ours. She’s absolutely incredible.A really extraordinary animal,with a lovely and big heart. Lammie is my hero. Never selfish; always giving; loving those who need her most. She is the true definition of mom. I am so glad to see she got this spotlight. Well deserved. Without Lammie who knows how Gertjie might have dealt with being alone. Lammie is a precious gift who has earned respect and love from all of us. Lammie is a little lamb. Her fleece is white and brown. And every where that Lammie goes her sons are all around. Hail to you Lammie. Thank you Ann and Lori, we couldn’t agree with you more. Lammie truly is a darling! Amazi’s passing was so devastating, I never really thought about how that affected Lammie, I am glad she takes comfort from her 4 chubby rhino babies. Such a great group of animals and such an amazing maternal instinct in Lammie to support these little orphans and give them comfort as they grow accustomed to their new lives. I am so thankful for her and how she has looked after Gertije, Matimba, Stompie and Balu. Discovering HESC is truly one of the most amazing things I have ever experienced and touches my life every single day. So thank you HESC and thank you Lammie for being a super sheep momma! Thank you very much. Very interesting.